About: City Cobbler offers a range of services including supplying and fitting locks. I'm digging all my old shoes! Went in to get a belt shortened. They did it straight away and refused to take even a penny from me. I have always found this shop really good.the service is always professional and they will go out of their way to help with anything I need,sending my dad's old clock off to be repaired,phoning me when it was ready to be collected. 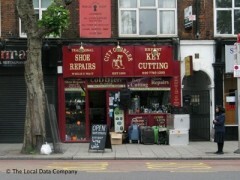 I had a key cut here, quick service, great price, key does the job. Like an idiot, I left my wallet on the counter, but didn't notice until the shop was closed. Called back the next day they were open and was relieved to find they'd kept it safe for me and I was able to go pick it up. Very very happy with the service. I've lived nearby for 9 years and have been to this shop loads of times. They've re-heeled and re-soled loads of my shoes and boots (including some very expensive ones), cut keys for my flat and my office, and they've just shortened a belt for me. I've always found them great (particularly Colin), hence taking the time to pen this review! Highly recommended. Like PM I paid a considerable amount to have a pair of boots altered which City Cobbler damaged, and then denied damaging. Staff were rude and dishonest - I would not recommend them. i have used this shop for about 27 years,they are very helpful and go out of there way to help,ive had shoes fixed,bags repaired,zips fitted, engraving and all sorts over the years and all done expertly and at a reasonable cost,theyve not been there for 30 years for nothing.ted of bermo. I found the staff in this shop rude and unpleasant. With plenty of other places offering similar services I'll steer well clear and would advise others to do the same. I paid £45 to have my boots resoled just before I left for a holiday but less than 24 hours later the boot came away from the top of the sole at the heel when I was taking them off on the plane. I took photos and kept the receipt from the second cobbler I had repair it, as I was abroad (Simon's Shoe Repair in Sydney, they were awesome!). The chap behind the counter denied I had even had the second repair and would not look at the photos or receipt, or where on the boot I was trying to show where it broke. He just kept pointing to his stitching on the bottom of the boot sole, but that was not where it broke and he just keeping yelling 'you didn't have it repaired'. I think they must have just slapped a new sole on without properly replacing it and securing it to the boot itself. I was really upset by how rude and defensive he was and felt I wasn't being listened to. I used this company to change my watch battery I found the service I received not good at all the people who run this shop are very rude and very unhelpful. They changed my battery and charged me £5.00 they would not give me a receipt and when i asked if they would guarantee the battery to last one year as i have always found to be the normal service when i have changed my watch battery elsewhere the comment i got was "it will last three to six months if that". As i had already handed over my money i has no option but to except this. My watch battery lasted two whole days when i returned to the shop they told me i did not get the battery from them, but i know i did and they refused to give me my money back. So I would not recommend this shop or any of its services to anyone.